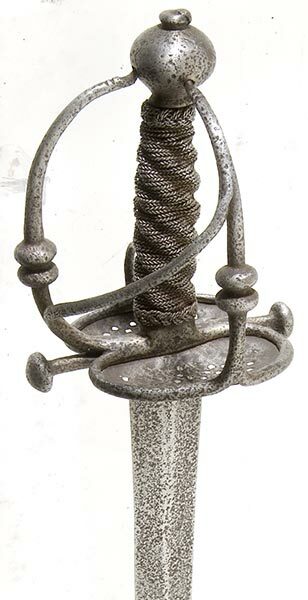 From a well known group of swords made for the Amsterdam Town Guard in the mid-17th Century, this sword is of typical “Walloon” style, with two large side-rings, each filled with a plate featuring pierced stars and circles. Knucklebow with expanded central section, screwed to the ovoid pommel. Large scrolled single quillon stamped with a floret as typically found, thumbring on reverse. Braided iron wire-wrapped grip. Double-edged 31 ½" blade with single 7" fuller, stamped “SAHAGOM” and with Solingen running wolf mark each side. Amsterdam town mark on ricasso. Very good condition overall with scattered light pitting. I've been wondering: Is there any relation between the Walloon hilt-style and the Walloon ethnic group and/or the region of Wallonia? These swords showed up in the Netherlands around 1640 - 1650. Most were made in the city of Solingen, Germany, for the Dutch. 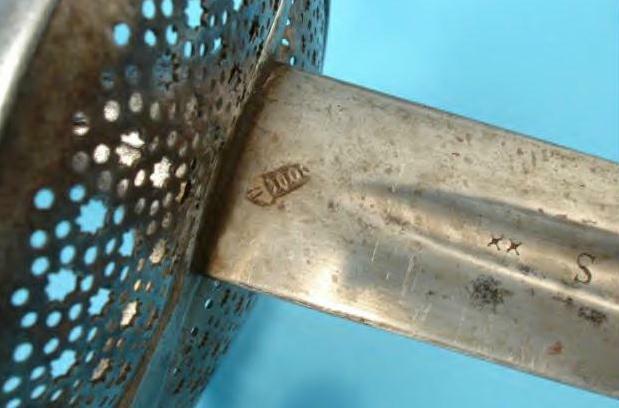 Many have the city mark of Amsterdam on their blades (see the crown mark in the third picture of the first post of this thread). The name Sahagum is also common on these blades. Nobody knows for sure why they were called Walloon swords. one idea is that the name was coined by 19th century collectors. 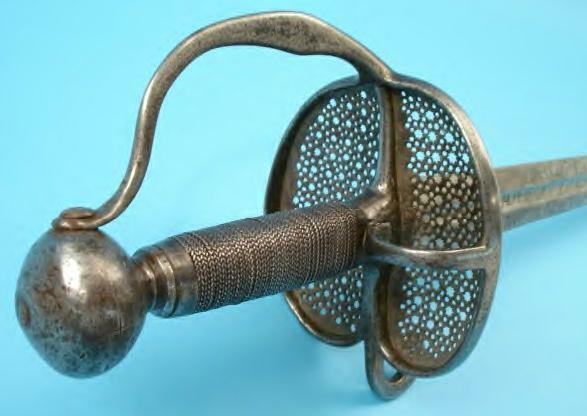 Another is that the French captured a pile of these swords during a campaign in the Netherlands in 1672-1673, decided to call it an epee' wallone', and then started supplying them to their own soldiers. By strict definition, because of the side guards, it may not be a Walloon sword. 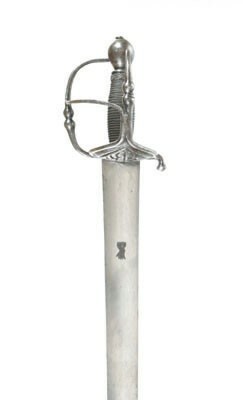 The website calls it a Velddegen, which roughly translates as - battlefield sword with a straight, two-edged blade. 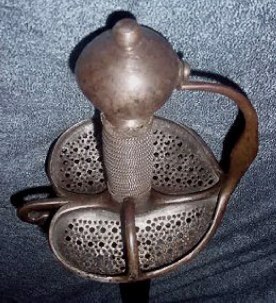 The side guards make it look a little like an Engish Mortuary sword, but the accompanying description says it has the double multi-pierced ring plates and thumb ring that you would expect in a Walloon hilt. If anyone has a photo of another view of this sword, I would love to see it. 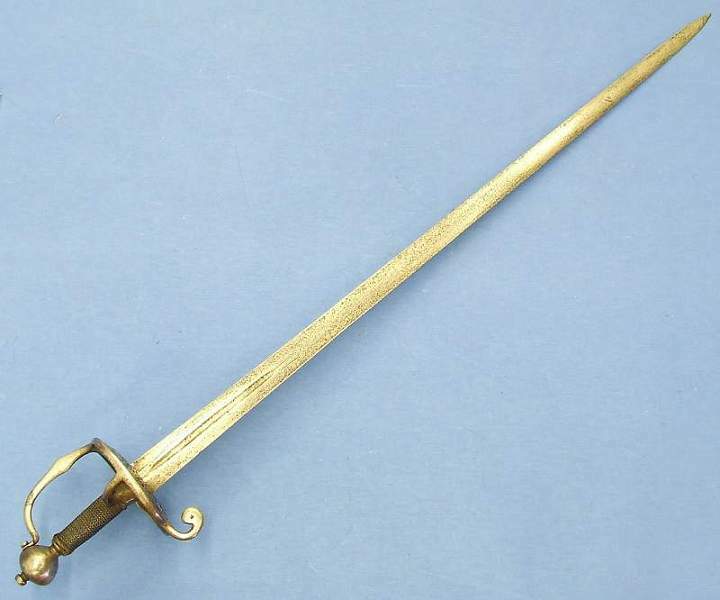 From what I know, the very first French regulation sword was indeed a Walloon sword. 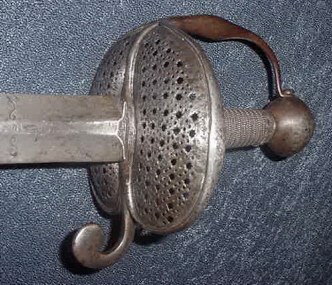 A great quantity of these had been ordered by the king in Solingen, following an edict of 1679 imposing a common weapon for all the cavalry. That would be just after the war in Netherlands indeed. From what is said in my book it does not seem that these were simply taken from the ennemy, but really made on purpose. The depiction of the sword in this same book fits your pictures so closely that I would have thought that this specimen was indeed a French Walloon... The only difference is obviously the Amsterdam town mark, every other aspect down to the shape of the guard and piercing of the plate is identical. Actually, is it possible that this sword had been taken from French troopers and stored in Amsterdam during a later conflict? These hilts were first used by the Dutch in the 1640's. I didn't mean to imply that the French only used the Walloon swords that they captured in the Netherlands. They probably thought that they were good swords,and then put in their own orders for them to the swordsmiths of Solingen. A footsoldier version with a 32 inch (or even shorter) blade. My past research indicates that the quatrefoil stamp on the quillon does mark this as a 1679 pattern Mine has it as well. I have heard two different things from two respectable sources on the quatrefoil stamp on the quillon, 1. the quatrefoil stamp was placed on the blade in Amsterdam, and 2. the quatrefoil stamp was placed on the quillon by the French before sending it to their allies. 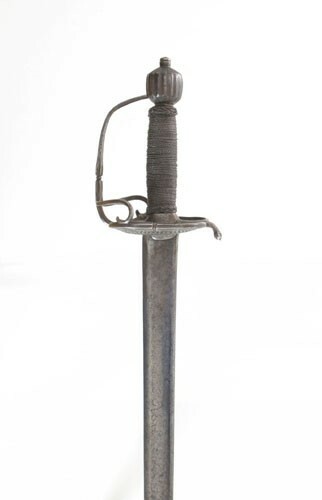 The French supplied these swords to their allies in Ireland (and elsewhere) during the war between James and William. It is my understanding that believe it or not, the 1679s were purchased by France through Amsterdam dealers who ordered the swords from Germany. Hence, the german, amsterdam and french stamps all on the same sword. It would seem the French could not order the swords directly from the Germans but the ever enterprising Dutch were more than willing to act as intermediaries to turn a buck during one of the lulls in the fighting in that period. 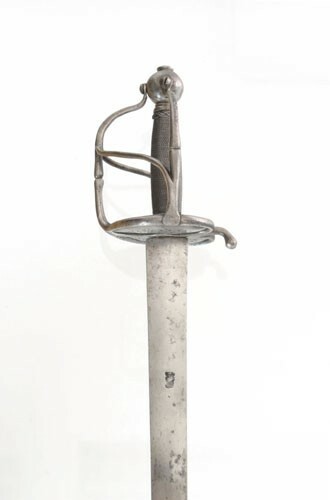 The general form of this sword was commonly used by the dutch troops as well during this period. This may be due to time period conflicts (Thirty Years War & British Civil Wars) plus the makers / smiths (Solingen). Here is another Velddegen from Hessink with some odd little scrolled branches. I'm putting up a few more pictures of two more Walloons before this thread goes over the horizon. The first is a cavalry version, the second two are of a French sword. I wonder why nobody has made a replica of this sword? I'm seriously considering asking someone (maybe Arms and Armor) to make a custom Walloon for me. Maybe the antiques are not prohibitively expensive. I bet there are a lot of them still around since the French had so many made for them. I've got one of these Dutch/French Walloons in my collection. It's similar to that shown by Roger, and mine has the stamp on the quillon, and a Sahagum + running wolf + Amsterdam stamps on the blade. Mine is unfortunately missing both pierced inserts (future restoration project). I've always liked the heft and balance of the sword, and also appreciate the aesthetics of this hilt style. I'd like to suggest that the sword from Hessink's with the little scrolled branches is English. Along with similar swords thathave passed through English auctions over the years, there's one illustrated in the booklet "Arms and Armour in Tudor and Stuart London" that's a virtual twin to the one shown in this thread. I'm putting up a few more pictures of two more Walloons before this thread goes over the horizon. I hope that this thread doesn't go over the horizon. These are really cool swords, and I would love to see more pictures and examples of them. First, another Walloon, dating from around 1660, with an overall length of 109m (43 in.). I love the profile on this one. it also has a perfect pear shaped pommel. Couldn't "Haudegen" mean something like "cutting sword" or "shearing-sword?" I’ve been looking around for a definition of this word. There just isn’t an exact translation. For the sword itself, I’ve come across “Slash and Shock”, which is sort of like Cut-and-Thrust. Old seems to be part of most of the translations. I say a Haudegen is a cagy, hardbitten, old veteran, like one of the Three Musketeers in their twilight years. Since I’m bringing up definitions, what really is the definition of a Walloon hilt? Is it just the early version, illustrated by the first photo in this thread? There are a lot of swords around that look almost exactly like it. 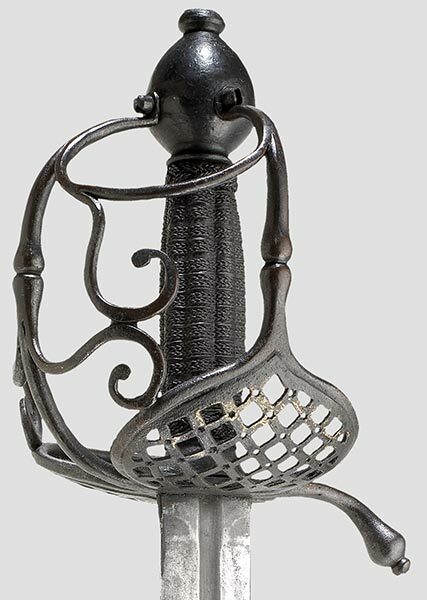 Or, as some believe, should it also include other 17th and 18th century swords with more complex hilts – lobed side and diagonal branches, round pommels, and different sized and shaped counterguards? 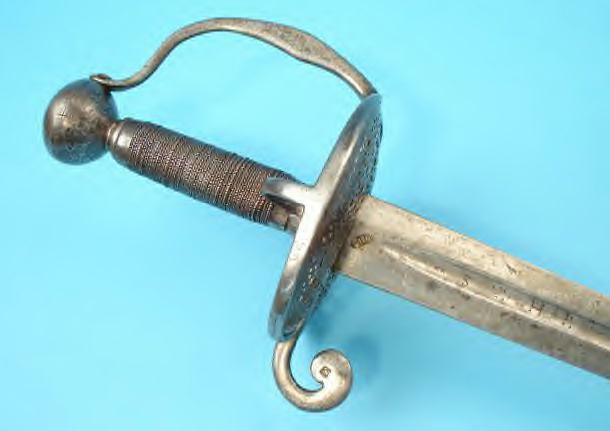 The name itself is suspect, since Wallonia, the southern part of Belgium, seems to have nothing to do with the sword, which was made in Solingen for the Dutch, particularly for Amsterdam, and later ordered by the French as a stock sword for their own army (and for their allies). So what do you think? Should all these swords be called Walloons, or should the other 17th century military swords – Haudegen and Felddegen - with more complex hilts be called something else?